October 30th, 2010 by KTU | Filed under 6. Interior Materials and Finishes, Park City Mountain Modern. The doors arrived this week. They’re beautiful. I’m really happy with them. The only problem was the stain/finish guy who delivered them knocked them over in his truck and dinged a bunch of them. He’s fixing ‘em (cheerfully, I might add). 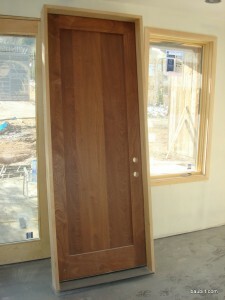 The doors came from Lemieux Doors in Canada. They were hung and finished by subcontractors to ProBuild, my materials supplier. They cost about $500 each, pre-hung and pre-finished (for 7 foot doors 1-1/2″ thick). The main entry door was a lot more, about $2000 all in. Worth it. 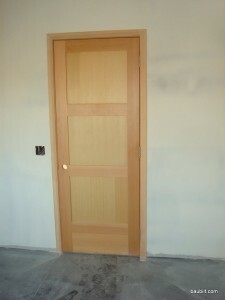 3-panel vertical-grain fir doors with 2-1/4 square-edge casing. Front door. This is mahogany with just a clear varnish. The natural color is very nice, in my opinion. This is an 8 ft. door 2" thick. 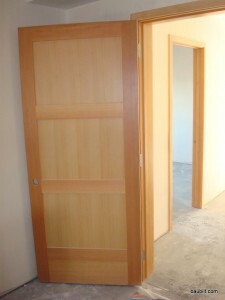 I’m looking for ideas for fir 3-panel closet doors and like your pics. 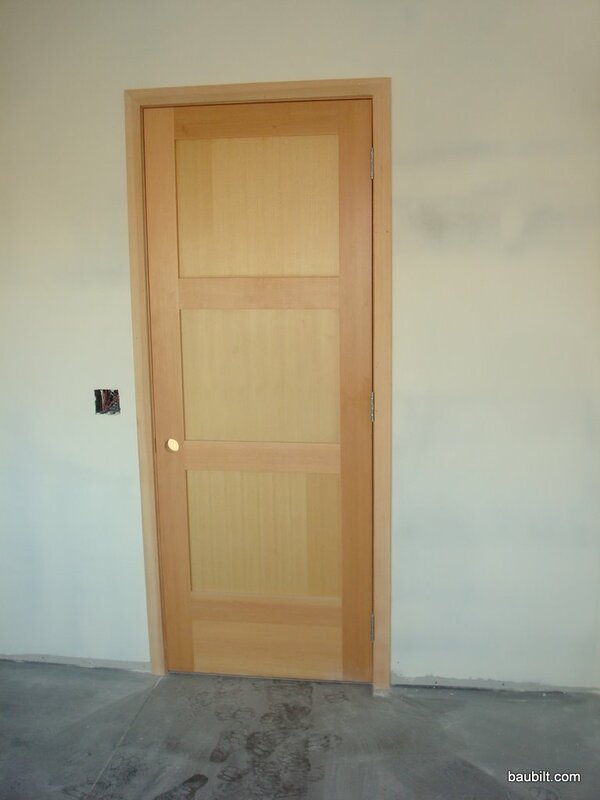 Did you stain the fir doors above? If so, what color? Thanks! These doors were not stained…just finished with clear lacquer. I can imagine using “natural” stain, but personally would not go any darker than that with fir.